Although there's something delicious about grilling your food outdoors over the charcoals, it's not always feasible to cook a meal outside. Whether it's because the weather is bad or you live in an apartment complex that doesn't even allow outdoor grills, indoor cooking is the only option for some folks. That's where indoor grills, such as the George Foreman Grill, comes in handy. While it might not provide the same smoky flavor as charcoal-grilled food, it does allow a healthy, quick way to cook your meal. When purchasing salmon, look for fillets that smell slightly of the sea. If it has a strong, fishy smell, don't purchase the fish. For this particular recipe, choose salmon fillets over salmon steaks. In a non-reactive bowl, whisk together lemon juice, 1 tablespoon olive oil, herbs, salt, and pepper. Rinse the salmon under cold water, and then pat it dry with a paper towel or clean kitchen towel. Add salmon to the olive mixture, turning to coat well. Let the salmon marinate while you preheat the George Foreman (or any indoor contact) grill. Place the salmon on George Foreman grill. Cook for 3 to 8 minutes. The cooking time will depend on the thickness of the salmon. The George Foreman tends to cook much faster than a regular grill, so check salmon at 3 minutes. If the salmon easily flakes when poked with a fork and is opaque throughout, it's done. If you don't have an indoor electric grill, you can also cook this salmon recipe on a grill pan on the stove. All cuts of fresh salmon will have pin bones, which are the fish's rib bones. It's easy to choke on this bones, so they should be removed. Lay the fish skin-side-down and run your fingers over the fillet; in most cases, you should feel the bones sticking out of the fish. Pull them straight up with clean tweezers or small kitchen pliers. If you're getting a little bit of white stuff on the flesh of your salmon as it cooks, don't worry too much. It's albumin, a protein that shows up from the fish's muscle fibers as it cooks, and it occurs on even perfectly cooked fish. However, it shows up more often on overcooked fish, so only keep the salmon on the grill for a minimum amount of time to minimize albumin formation. Teriyaki salmon: Eliminate the lemon juice and herbs. In a bowl, combine 1/4 cup brown sugar, minced garlic, ground ginger, 2 tablespoons of honey, and 1/4 cup soy sauce. Marinate the salmon for at least one hour in the refrigerator, and then grill according to recipe instructions. 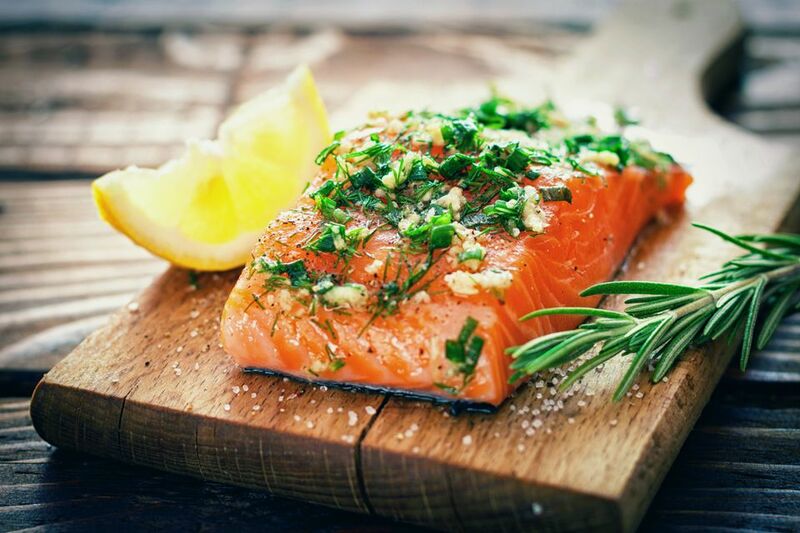 Barbecue salmon: Eliminate the lemon juice and herbs. In a bowl, combine a 1/2 cup of barbecue salmon and 2 tablespoons honey. As you grill the salmon, brush the sauce over the fish occasionally. Lemon-Garlic salmon: Add 1 tablespoon of minced garlic and 2 teaspoons of lemon zest to the marinade. No-flip grilled salmon keeps things easy and mess-free!